Shuttle has introduced its new ultra-compact personal computer, the XPC Slim DH370. The new desktop PC barebones is aimed primarily at multi-display special-purpose applications and can drive up to three monitors using Intel’s iGPU, but it can naturally be used as an office or home computer. The XPC Slim DH370 is designed for Coffee Lake processors with up to six cores and mainstream TDP. Shuttle’s latest XPC slim DH370 comes in a small chassis measuring 19×16.5×4.3 cm, the same as the XPC slim DH310 launched back in August. Both systems support Intel’s 8th Gen up to six cores and use Shuttle’s ICE module featuring a large heatsink and two 60-mm fans, one of which is PWM-controlled. Both machines support up to Intel’s six-core Core i7-8700 processor. Shuttle guarantees that its ICE modules can ensure a stable 24/7 operation in 50⁰C environments. As the name suggests, the key difference between the XPC Slim DH370 and the XPC Slim DH310 is the chipset. Intel’s H370 chipset in the DH370 enables more PCIe 3.0 lanes and USB 3.1 Gen 2 support. Tthe new system also has three 4K display outputs (2 x DP 1.2, 1 x HDMI 2.0) that enable Shuttle to aim it at applications that require three monitors, including flight controls, retail, digital signage, and more. When it comes to other things, the XPC slim DH370 and the XPC slim DH310 are generally similar. 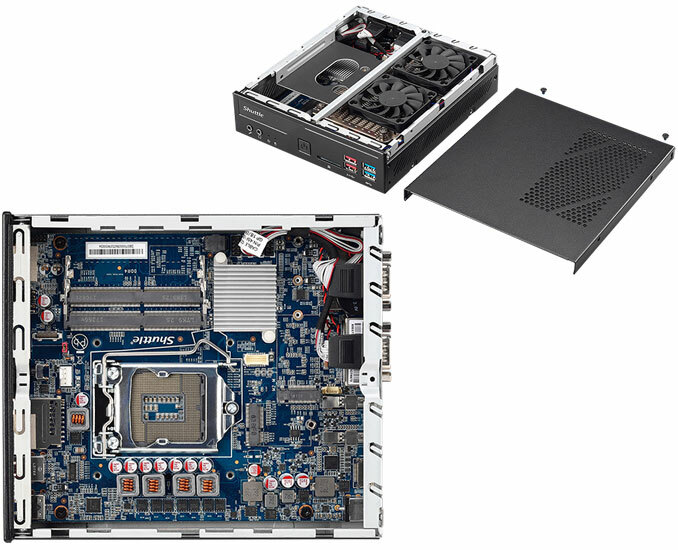 Both machines feature two SO-DIMM slots for up to 32 GB of DDR4-2666 memory, one 2.5-inch/7-mm bay for a storage drive, an M.2-2280 slot for an PCIe 3.0 x4 or SATA SSD, and an SD card reader. The motherboard design is a custom form factor built for Shuttle. As for connectivity, the Shuttle XPC Slim DH370 has eight USB Type-A ports (four USB 3.1 Gen 1 and four USB 3.1 Gen 2), two GbE connectors (driven by Intel’s i211 controllers), two COM ports, and two 3.5-mm audio headers. Also, the new unit has an M.2-2230 slot for Intel’s Wireless-AC 9560 802.11ac Wi-Fi solution featuring a CNVi interface. Power wise, the XPC slim DH370 is equipped with a 90 W external PSU. Shuttle has not announced MSRP of its XPC Slim DH370 barebones, though expect the system to cost more than ~$250, which is the price of the barebones XPC Slim DH310. "a small chassis measuring 19×16.5×4.3 cm"
They couldn't have made it 17mm less tall and 19.1mm narrower?